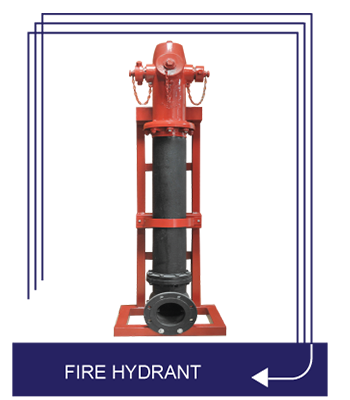 Minova hydrant is a simple version of the pillar hydrant for 100 mm and 150 mm diameter. Suitable for locations or areas where damage may be caused by impact or frost. Dry barrel design eliminates damage to the hydrant caused by freezing or corrosion of the upper part of the flange. Designed as per “AWWA C502 & NFPA STANDARD”, which applies for the wall thickness, loss of head and hose connection plugs. Externally sand blasted for smooth finish, painted red with electrostatic powder coating on the section above the ground and double coating of black bituminous paint on the section below ground. • Dry barrel design eliminates damage to the hydrant caused by freezing or corrosion of the upper part. 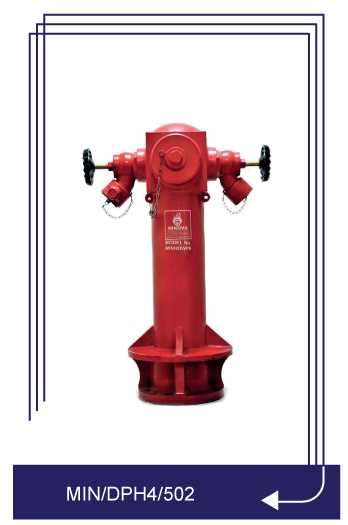 • Break away design to prevent accidents to the hydrants, where only the upper part of the flange would be broke upon impact. • Simple rugged construction and easy to maintain. • The ground and double coating of black bituminous paint on the section below ground. Optional: barrel length extension kit in different lengths is available on request. • Hydrant outlet valve with different models available upon request.